Hear from researchers who have pursued a different path to gain global impact for their work – building a successful startup business. Uniseed – a partner of the University of Melbourne – provides investment funding to commercialise research-developed technologies that bring significant impact to communities. 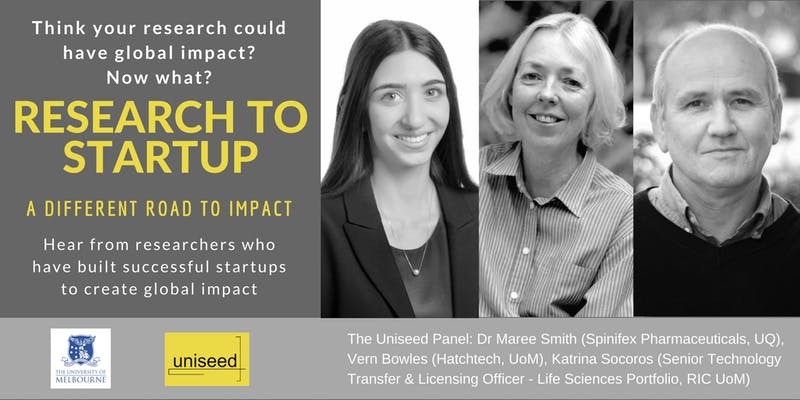 Uniseed has brought together a panel of researchers turned entrepreneurs who will share the highs and lows of their experience – from discussions with the Tech Transfer Office, leaving university (or not! ), raising capital, forming teams and being in business. Every journey is different, but all have been fulfilling. Professor Vern Bowles was Founder and Chief Scientific Officer of Hatchtech which has developed a novel treatment for headlice. The research underpinning the core intellectual property of Hatchtech – XeglyzeTMLotion – is the culmination of 15 years of his work. In 2015, Hatchtech signed a USD 200 million agreement with pharmaceutical company Dr Reddy's Laboratories to commercialise the product. Vern is the Deputy Director of the Centre for Animal Biotechnology at the University of Melbourne. Dr John Kurek is the Biotechnology Investment Manager of Uniseed. John is responsible for identifying new investment opportunities and managing Uniseed's overall biotechnology and life sciences portfolio. John's previous roles have included Pharmaceutic Development Manager at BioDiem Ltd, where he was responsible for managing the preclinical, clinical and regulatory aspects of BioDem's drug development programs, and Preclinical Development Manager at Amrad Corporation Ltd where he was responsible for the management of preclinical drug test. Drinks and canapes to follow panel discussion.